This is a hair journey and I feel like I am going to make lot of discoveries with my hair and my regimen may continue to change till I am satisfied or my hair is satisfied. Recently, I made a post about my Curly Girl Regimen. Well, not only have I made changes to that method, I have decided to not use WNGs as my only styling option. I want to know my hair and enjoy it. The only way by which that can happen is by not restricting my self to one style. Although, less manipulation is very instrumental to retaining length, especially where fine hair is concerned. I also have to point out that I am not crazy about having long hair anymore. I just want my hair to be healthy. Eversince I started wearing WNGs, I have noticed how my hair is easily weighed down by certain products, even the ones I love so much. As much as TRESemme Naturals Conditioner , in combo with Loreal Everstyle Gel, gave me the best WNG styles, and I love TRESemme, I have to stop leaving it in my hair. It weighs my hair down tremendously. I have decided to use it only for co-washes. I am trying out Curls Curl Creme Brule as my Leave in conditioner and have not formed an opinion about yet. In the morning, I untwist and slightly fluff my hair to prevent frizzes. I also use a little bit of Jojoba oil when I am untwisting. You bettta workkkkk it girl lOl,for starters I'm lovin how natural ya make up looks..& tha hair,earrings,& smile tops its all off (smiles)very slick!,I'm also enjoyn ya hair journey btw..Yah bless! 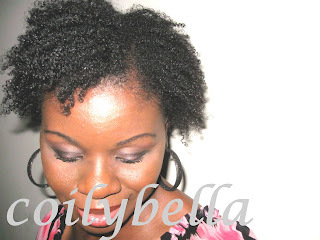 Hi Coilybella, I have been doing the CG Method since my hair cut on 3/31. I too have decided to utilize the twist out and use Tresemme naturals as my cowash and rinse the conditioner from my hair. I have been using the Giovanni Direct Leave In with a bit of jojoba oil and then Twisting with Shea Moisture Curl Enhancing Smoothie and have been getting great results. I do thing the 2 months of the CG method Wash N Go's did help me to achieve better hydration and moisture levels in my hair and with my regimen of Water, oil, Leave-In, Cream Moisturizer/styler, oil... it has continued to keep my hair at great hydration levels with nothing but Good Hair Days. Yes I will still wear my curls as my go to style when in a hurry but I am easily retwisting at night and getting great results the next day. I definitely think this routine is giving my hair better chances of retaining length although I am manipulating every night, it is free of tangles and all and I am still using finger detangling and only having to do that on wash days. Loving your results and we are learning our hair. I have been natural 3 1/2 years and I am constantly surprised at what my hair teaches me.